Verizon MVNO BYO Wireless is now offering service on the T-Mobile network. LTE is available and there's no roaming. SIMs are $10 including shipping and handling. Plan prices are the same as with BYO's Verizon based CDMA service. There have also been some changes to BYO's plans and pricing. The $30 1000 minute, unlimited texts, 400 MB and the $40 unlimited talk and text 500 MB plans have been discontinued. There are new $55 and $70 unlimited talk and text plans with 1.5 and 2.5 GB respectively. Bundle credits are good for 30 days and do not roll over. The best news is that BYO is now doubling the amount of data with all plans for customers who enroll in auto pay. 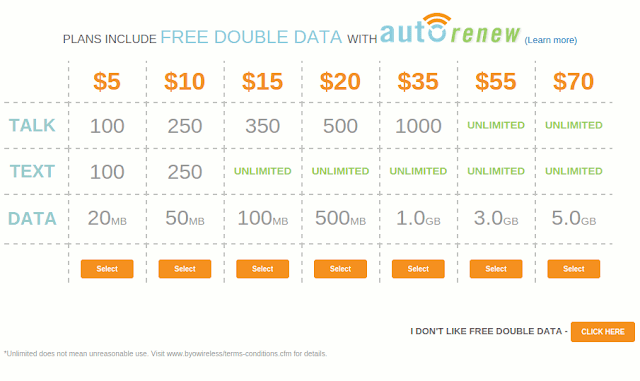 The double data for auto pay finally makes BYO pricing competitive with other Verizon MVNOs. It does seem like a rather extreme way to encourage users to enroll in auto pay. I'm not so sure about BYO charging the same prices for T-Mobile based service. Users expect to pay a premium for Verizon coverage, but not for T-Mobile, especially without LTE or roaming. 1 BYO adds State and local sales taxes, 911 fees and a Universal Service Fund fee to monthly plan prices. These taxes and fees vary by state and locality and range from 7% to 16%. Update 12/12 6PM. BYO is now saying LTE is enabled on their GSM plans and that they have no immediate plans for service on the AT&T network. "We have enabled the AT&T devices today after testing to make sure they will work with our BYO Wireless Sim cards. Our service coverage for the GSM is not on the AT&T network but our SIM cards are able to work in unlocked AT&T devices." Also received this as well, so we can pretty much put to rest the ATT speculation. "We are offering GSM service on the T-Mobile Prepaid network only and I do not know of any plans to add another GSM service in the near future.That is not to say that at some point it won't happen but right all we are offering is the T-Mobile. The GSM service does not include off network roaming but it does include LTE service. The plans listed are for both our CDMA and GSM service." Interesting. When I called them this morning I was told that LTE was not available. Let's wait and see if anyone actually gets LTE or not with BYO GSM. BYO Matt over on Howard Forums also confirmed LTE. $20 is the only competitive plan but added taxes of up to 16% is not so nice. BYO also beats almost ALL of the new Puppy Wireless monthly plans, even with taxes included. The exception is the $39.99 Puppy plan. BYO with Autopay also beats PagePlus monthly plans in value/money. 'nuff for you. 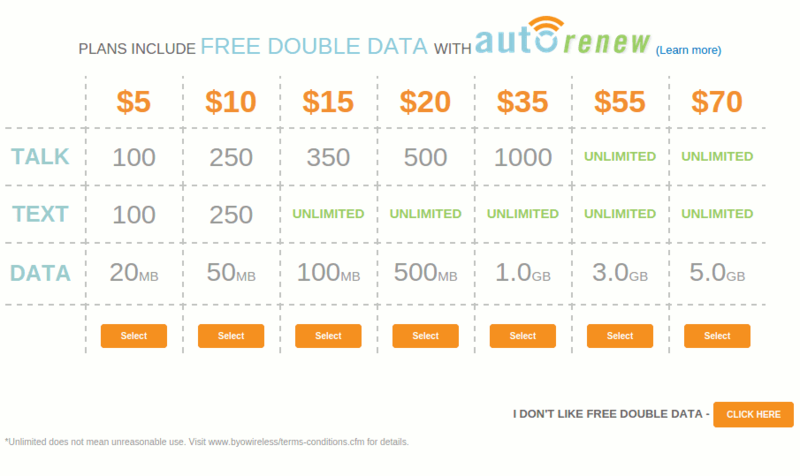 Byo has 5 plans that cost less per month than the MetroPCS plans that have data. I thought we were talking about a new Byo PHONE plan. RedPocket $10/month on T-Mobile is for hotspots only. And their $20/month phone plan is throttled to 2G. Then you have their poor CS with super-long hold times. And you cannot buy a refill from them without your Verified by VISA password, etc. Well, you maybe right about their poor customer service, but its a hell of a deal for use on an extra/backup phone. I've been using the $10 plan on an unlocked Nexus 4 along with the Hangouts Dialer app and a Google Voice number. Uses about .5 MB per minute. Great if you have a good T-Mo HSPA+ signal where you use your phone. I have Red Pocket GSM-T $5/500 MB on my phone, using Hangouts for phone calls (which works surprisingly well), and I was looking at this BYO $5/month plan (100/100/20MB) for alternative and think that Red Pocket is better. I don't know about RP customer support (never needed it), but the RP-GSMT $5/month 500 MB plan is definitely not 'hot-spot only' as you mentioned, and it is definitely not throttled. In fact, my AT&T phone showed 'LTE' connection most of the time (speedtest shows up to 15 Mbps download speed). My payment is also setup extremely easy through PayPal subscription. No need for verified by VISA stuff (although this wouldn't be a problem for me if it did). I do not see a "Red pocket $10 1GB on T-Mo" or a "Red Pocket GSM-T $5/500 MB" on the RP website or Dennis' review of RedPocket. Where do you get them? OP and replies #2 and 3 are comparing apples and oranges. They must be using the mobile data plan in a phone, so all calling is VOIP. Works OK with a strong 3G-4G signal, but doesn't work at all for calling in rural areas over Tmo 2G. The $5/500MB plan is probably grandfathered; it doesn't appear to be for sale any more. These are under 'Mobile Internet Plans' (http://goredpocket.com/plans#mobile-internet). The $5/500 MB isn't listed, but it's available when you're activating a new line. OP never said that this is a comparison that works for everyone, just said 'for thrifty users', and he's right, it's a legitimate option for people who can make it work, and/or for a backup line on a second phone. And the $5/500 MB isn't listed but is still available. I just activated a line less than a week ago. "OP never said that this is a comparison that works for everyone" is a straw-man argument. All-VOIP only works for 'thrifty users' who don't need reliable voice service. Exactly. There's absolutely no way that what the OP was saying is untrue, and you seem to be agreeing with it. So what are we arguing here? Typo in table on 5GB BYO plan price. How do you know BYO offers LTE on T-Mobile? Nobody said that. Go back and read the article. Yes they did. I meant to reply to the post below "BYO is offering LTE on their T-Mobile service"
"Users expect to pay a premium for Verizon coverage, but not for T-Mobile, especially without LTE or roaming." BYO is offering LTE on their T-Mobile service. It's still T-Mobile, with no roaming. I have a Striaght Talk iPhone 5 that works on Pageplus. Anyone know how to get it on BYO? Their device check does not have an option from Straight Talk phones. Use the Verizon iPhone 5 option - that is what you have. Looks like you are going to say you have a GSM Apple iPhone 4S (or any T-Mobile GSM phone) and get a T-Mobile SIM for service until they support the iPhone 5 on BYO. If you want them to activate it as a 3G phone on the Verizon network you will need to say its a Verizon phone, I'd try the Apple 4S and enter the MEID. If you want to use it of T-Mobile, say it's a T-Mobile iPhone 5 (the 4s uses a micro SIM, the 4 a nano). Is word verification gone at last? Awesome! I don't think it's completely gone but Google seems to be applying it to fewer anonymous commentators than before. Google? I thought it was Blogger? Tried putting GSM and my zip code into their coverage checker and it says no service in my area, yet if I go to TMobile or AT&T they show perfect coverage at my location. No roaming. Use the GoSmart or Ptel map and you should get the same no service. No, if I check Go Smart it shows as either Excellent or Very Strong where I am and all around me. Then BYO coverage checker is wrong for your zip code. Many TMobile MVNOs say no service in my area when Tmobile coverage map says Very Strong. I put in the zip of a larger town 15 miles north when ordering and have never had a problem. Red Pocket T-Mobile GSM(T) Sims for phone or mobile devices are $1.00 with free shipping right now. Does BYO offer LTE on Verizon? Where did the idea BYO was planning to offer AT&T based service come from? BYO customer support reps who turned out to be mistaken. I have apple iphone 5 unlocked. can i buy BYO to use in this iphone5? No, BYO doesn' accept LTE phones like the iPhone 5.
not true. they accept tmo iphones up to 6 and att and cricket iphones up to 5s for gsm / tmo coverage. BYO is missing the (t) in the news by carrier column. BYO terms say every sixth month is free for $5-15 plans. Higher plans get a $15 credit after 6 consecutive months of service. How do the data add-ons work? Do they replace plan data or are they used before or after plan data? 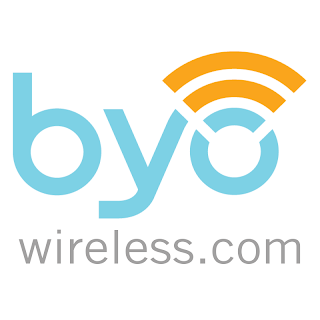 BYO Wireless - Get 50% OFF of your first month with plan code: FIFTYOFF. Also, get a FREE SIM CARD with any GSM Phone. 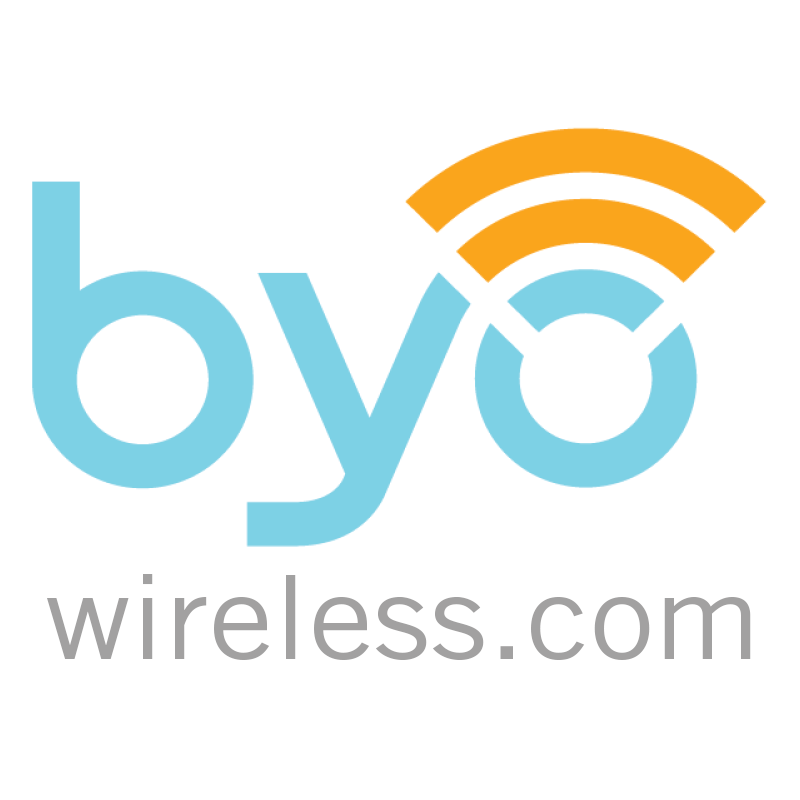 BYOWireless: Not truly unlimited testing. I have the $20 plan advertised as unlimited text. nce 4K limit is reached, BYO wireless disables the phone line and it took us two months to figure out that they have set this limit of 4000 texts. I still had 350 mins and 450 MB on my data available. When we contacted the customer service - they added "extra texts" as a courtsey. It is a scam. This happened each time three days before the month end. When I requested that they increase the limit, they could not guarantee it. Clearly there are unpublished limits! Don't stay mad at Byo. Just switch to the $10 plan with a $10 or $15 add-on bundle.